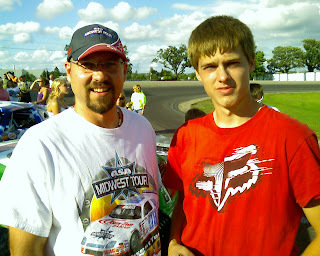 ASA Midwest tour rookie driver and rising star NICK PANITZKE, the teenager from Sauk Centre MN will be our guest Saturday Oct 3rd. Nick currently is in 14th place in the ASA Midwest tour point standings, he finished in 9th place Saturday night during the "Race for the Gold 125" at Elko Speedway. He also is a former MN Governors Cup winner. Jason and Dean are back "in studio" this weekend after 3 weeks "on the road." We will have our regular guests, Jordan Bianchi and Dan Plan on the show this week. Dean was right when he picked Jimmie Johnson to win at the MONSTER MILE in Dover, Jordan came in second AGAIN with his Mark Martin pick. Dean takes back the point lead with 10 points in the "Chase for the Allmindinger cup" .. Jordan has 8 points, and Jason 5. We now found out that at 14yrs and 7 mo old, Matt has become Minnesota's youngest ever feature winner in the Legends divison... Congrats Matt! Dan Fredrickson wins the ASA midwest tour race from ELKO, Chris Wimmer second, Steve Holtzhausen third (and he got the $4000 gold bar). Very close and competitive race, we interviewed about 15 drivers and we got many nice comments from web-cast listeners from near and far. NASCAR picks: Jordan took Mark Martin at Dover, Dean chose Jimmie Johnson and Jason will go with Greg Biffle. Speedtalk on 1360 11-noon live from ELKO SPEEDWAY on KRWC 1360 in Buffalo. Over a dozen racers will be interviewed. 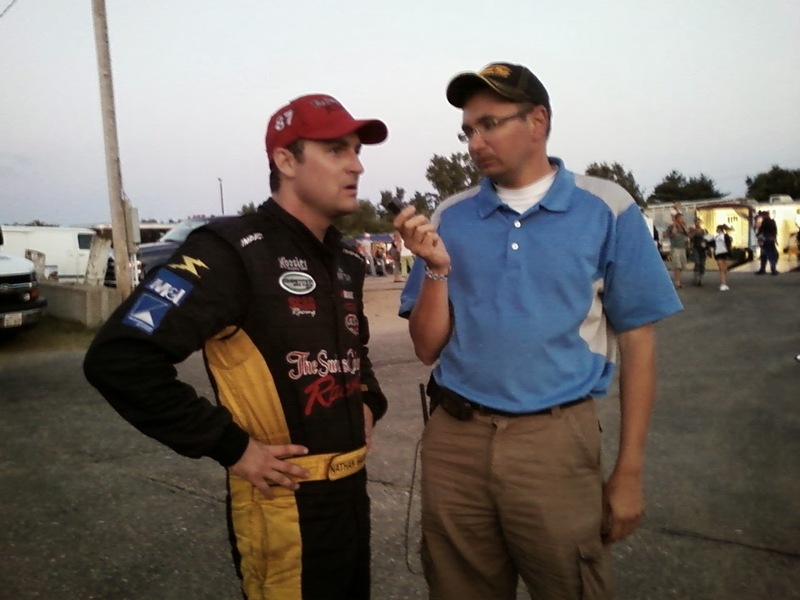 BUFFALO, MN (Sept. 23, 2009) - Speed Talk On 1360, Minnesota’s newest radio racing program, takes it’s show on the road this week with complete coverage from the ASA Midwest Tour race at Elko Speedway on Saturday September 26th. Jason Searcy and Dean Reller will broadcast from the pits from 11 AM to Noon on AM 1360 KRWC. They will recap all the latest racing news and then set the stage for the ASA Midwest Tour Race for the Gold 125. Full ASA Midwest Tour race coverage will be available online at www.krwc1360.com starting at 7 PM. 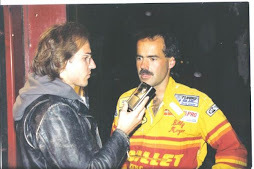 Hosts Searcy and Reller have over 35 years combined experience in motorsports reporting and bring an energetic approach to covering the sport. The pair have announced several motorsports events throughout the region including the inaugural race for the ASA Midwest Tour. "We are big followers of the ASA Midwest Tour and are very excited to be able to bring the action home to everyone online," said Reller co-host of the show. "The Race For The Gold looks to be very exciting as several different drivers have a shot at the Championship. It will not only be a fun race to watch, but it will be a fun race to call in the broadcast booth." 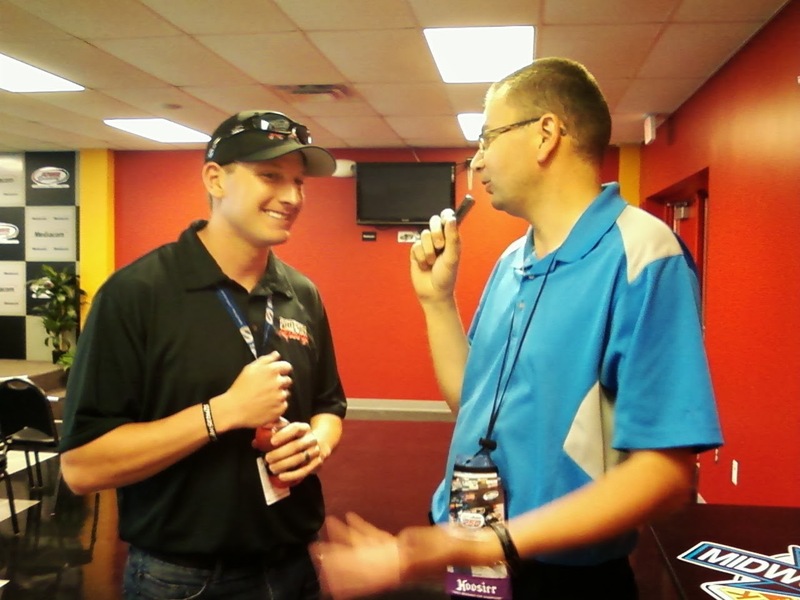 Speed Talk on 1360 airs weekly from 11 AM to Noon throughout the entire racing season. 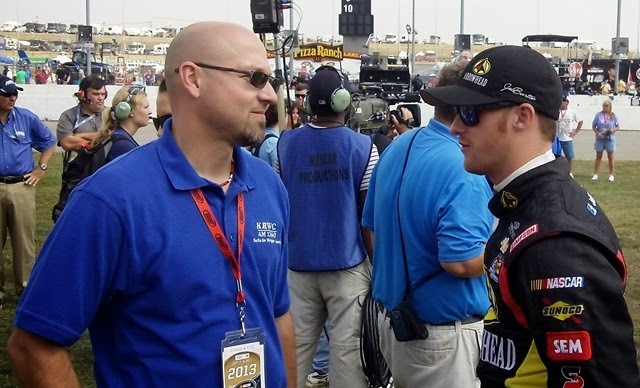 Each week the show breaks down the racing action nationally and locally with regular guests such as NASCAR Racing "Geek" Jordan Bianchi and local journalist Dan Plan. 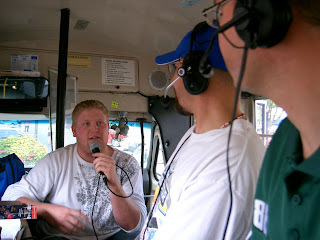 For more information on the show visit www.speedtalkon1360.com. AM 1360 KRWC, is 24-hour news and information station located in Buffalo, MN. The station features local news and sports coverage and nationally syndicated programing. For more information visit www.krwc1360.com. 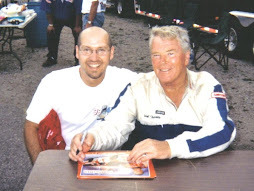 With a heavy heart we are sad to announce the passing of a former racecar driver that we have known for many years. Super Late Model driver Neil Knuth of Monticello, MN passed away on Tuesday September 22nd. 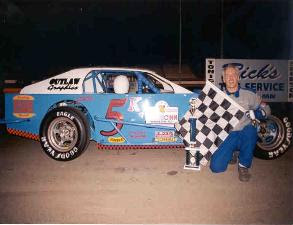 Knuth traveled from South Dakota to race Modifieds at the Fergus Falls Raceway for several years. He would later move to Monticello and continued to make the trek to Fergus Falls nearly every week. Eventually he switched to a Super Late Model that he raced at the Fergus Falls Raceway and the I-94 Raceway in Sauk Centre. Neil is best remembered for his love of racing and the sportsmanship that he extended to all his fellow competitors and his fans. The Funneral is scheduled for 2 PM Saturday Sept. 26th at the Peterson-Grimsmo Chapel in Monticello. Visitation will be held from Noon until 2 PM. Mark Martin won at New Hampshire just as Jason predicted, Jordan picked Denny Hamlin, who finished second. 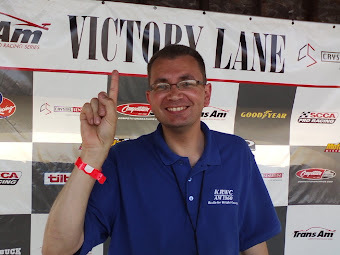 Speedtalk will be LIVE at ELKO Speedway on Saturday from 11-noon, then we will broadcast the ASA midwest tour race via web-cast on www.krwc1360.com beginning at 7pm on Saturday night. Dean took the hobbled Carl Edwards, Jason picked the eternal one Mark Martin and Jordan thinks Denny Hamlin will win his second straight race. Jason predicts Mark Martin will win the chase, Jordan took Jimmie Johnson to win his fourth straight title and Dean thinks Tony Stewart will win the chase this year. 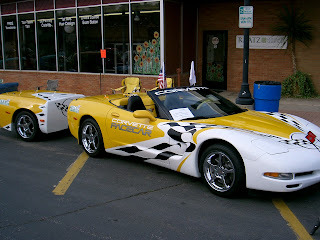 Our live remote broadcast from "the country store" was fun, we had a demo car on display, interviewed 4cyl driver Mike Dimmick and ASA midwest tour president Tim Olson stopped by too. Speedtalk LIVE at the "Country Store"
We are doing our broadcast LIVE at the COUNTRY STORE in Buffalo (1 block West of McDonalds). Its their tent sale and customer appreciation day. We will have a couple different Demo Derby cars on display and some drivers to interview. Dean and Jason will talk about the NASCAR chase for the championship and also we will get Jordan's picks. 11-noon Saturday Sep 19th on KRWC 1360am. E-MAIL us YOUR PICK on "who will win the chase"
If you get it right, I will send you a prize... and for tie-breaker also send us WHO you think will finish LAST (12th). Awesome cars at "Classics by the lake"
Classic Corvette Pace car at the Buffalo car show. 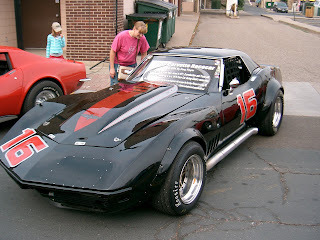 Doug Rippie's Corvette Race car. Classic's by the lake in Buffalo was a huge sucess on Sep 12th. Jason in front of the "road show bus"
Dean Reller at the Car show. Saturday Sep 12th Speedtalk on 1360 was LIVE at the Buffalo Car show "classics on the lake." 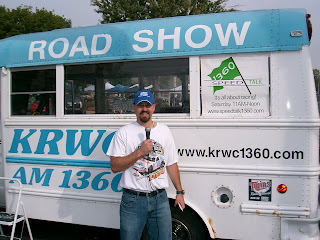 Over 400 classic cars were on display and a large crowd listened to the radio show from the KRWC Road show blue bus. Next Saturday Sep 19th .. Speedtalk will be LIVE at the Country Store (1 block West of McDonalds) in Buffalo .. normal time 11-noon. Come see us! Denny Hamlin won the NASCAR race in front of his home-town crowd in Richmond VA Saturday night. Kyle Busch just missed the chase and finshed 13th in points, Brian Vickers had a strong showing and moved up to 12th place in points, he makes the chase for the first time. Matt Kenseth never got it going on Saturday night, he had a bad night at the wrong time and fell out of the chase. Danica to Nascar in 2010. Tony Stewart has said that Danica told him that NASCAR is "what she wants to do." Sounds like she will re-sign with her IRL team for next year and run a limited schedule of NASCAR Nationwide series & Camping world Truck series races in 2010 with a long-term goal of racing full-time in the NASCAR Sprint Cup series. Who she will race for has not been announced yet, Stewart-Haas racing seems to be the favorite to supply her Sprint Cup cars but she will need to align herself with a different team to race in the NASCAR Nationwide or Truck series. 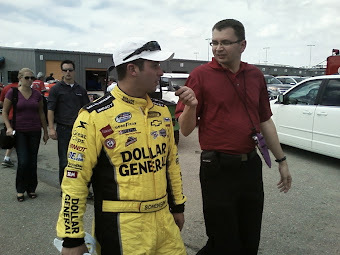 Details will be announced soon... here is an article from this summer that sums up my views on Danica coming to NASCAR. I have no doubt that she will have sucess after 10-15 starts when she gets the feel of the much heavier stock-cars. Danica to NASCAR in 2010? 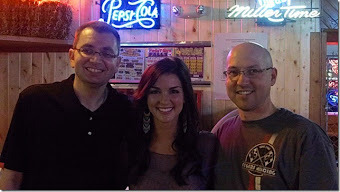 I think Danica Patrick will be racing in the NASCAR Sprint cup series in 2010, most likely for Hendrick Motorsports. It just makes too much financial sense.Strike while the iron is hot! Danica Patrick is at the peak of her INDY Car career.. now is the time to move. According to Forbes.com, Danica earned only $7 million in 2008. That does not even compare to the $35 million Dale Jr made or even the $30 million Jeff Gord0n pulled in driving for Hendrick Motorsports. Danica will NEVER make that kind of money driving in the INDY Car series. Why do you think Juan Pablo Montoya, Sam Hornish, Patrick Carpentier, Dario Franchitti and even AJ Allmendinger moved from Indy Cars to NASCAR? Because the pay was better.You say that Hendrick Motorsports doesnt have a spot open. Maybe Dale Jr will start up his own Hendrick satellite team like Tony Stewart did this year, and that would open up a spot to bring Danica into the best equipment and crew money can buy.Hendrick can lure Go Daddy and other sponsors into paying top-price ad rates on her car plus all the added publicity that would go with it. Would she race in NASCAR Sprint cup in 2010? You bet she would. Race as many NASCAR Truck series and NASCAR Nationwide series races as possible this year after the INDY Car series is over, drive a Cup car a couple times the end of the 2009 season and then start her full-time in a Sprint Cup car in 2010.I think it makes too much dollars and sense not to. 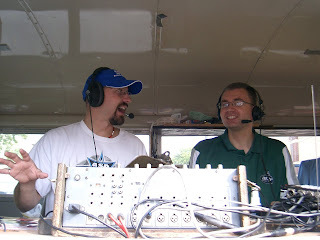 Dean and Jason will broadcast LIVE from the KRWC Roadshow bus at the car show in downtown Buffalo on Saturday from 11-noon. 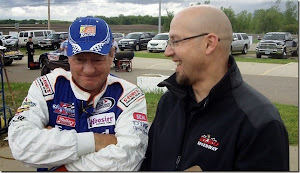 Great North Legends driver #27 Pat Zandstra from Buffalo will have his car on display and will be the driver interview. 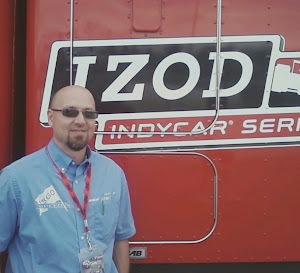 "the racing geek" Jordan Bianchi might join us to talk all things NASCAR. Dean and Jordan both think Jimmie Johnson will win the Atlanta NASCAR race on Sunday night. Jason went out on a limb and took Dale Earnhardt Jr. to win his first race in a year and a half. David Wray was a great interview.. we hope to have a p0d-cast option soon. 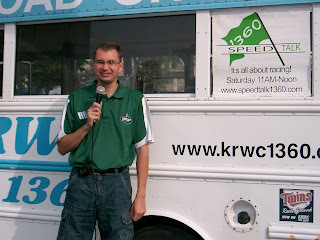 Remember we will be LIVE at the Buffalo classic car show next Saturday Sep 12th... Look for the KRWC roadshow bus and join us for the SPEEDTALK on 1360 show from 11-noon. 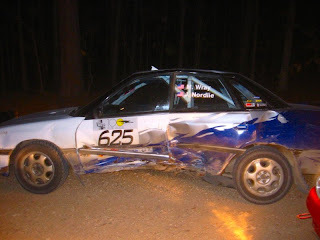 This is what it looks like when you hit a tree during a race. The amazing thing was, he still won his class! Rally Racer Mike Wray from Buffalo will talk about rally cars and tracks... and what it is like to be at the X-games. We will talk with Rally-racer Mike Wray from Buffalo. 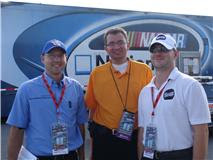 Jordan Bianchi will pre-view the Atlanta NASCAR race.. only two more races before the CHASE begins. Dan Plan with the local racing recap. Jason, Jordan and Dean will give their NASCAR picks as the three of us battle for the Allmindinger cup.